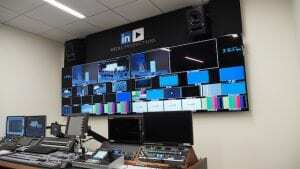 Richmond, CA—April 2019… LinkedIn, the business-oriented professional network platform, is riding a technology wave with the recent introduction of LinkedIn Live, a platform for live video streaming. 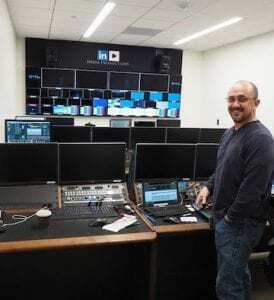 To support LinkedIn Live and other media ventures, Gary Schneider, LinkedIn’s Lead Media Systems Architect, has spent four years spearheading an initiative to enable LinkedIn to produce video and audio remotely, streaming broadcast-quality media over IP between production facilities worldwide. The leap from standard video conferencing to broadcast quality was a tremendous challenge for which Schneider required the kind of help most AV contractors couldn’t provide. Needing someone who could fully grasp his cutting-edge vision and make it a reality, Schneider turned to one of the few specialty AV integrators with the experience and expertise to pull it off: Richmond, California-based David Carroll Associates. What Schneider is trying to accomplish is to build a remote production network. 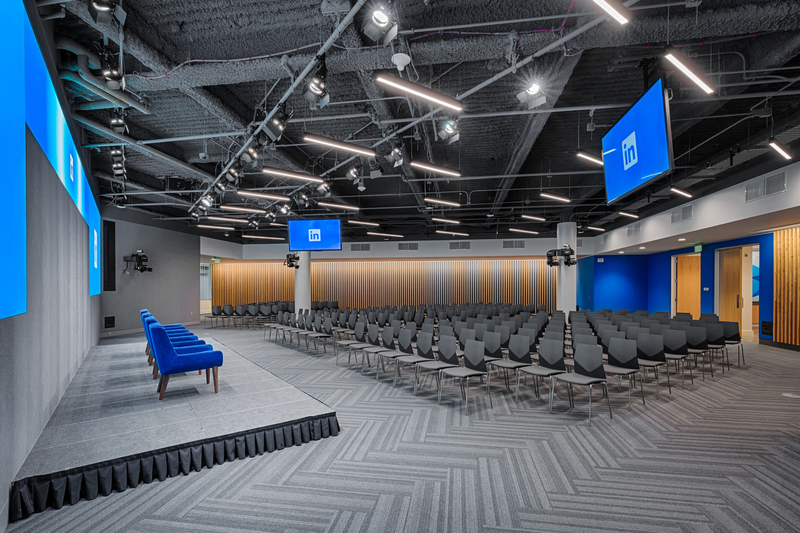 LinkedIn has invested in significant media production facilities at its Sunnyvale, California, headquarters and a few other locations in the San Francisco Bay Area. As ​the company planned an upgrade to its production facility in New York City’s Empire State Building, Schneider saw an opportunity to take the leap into remote integration. 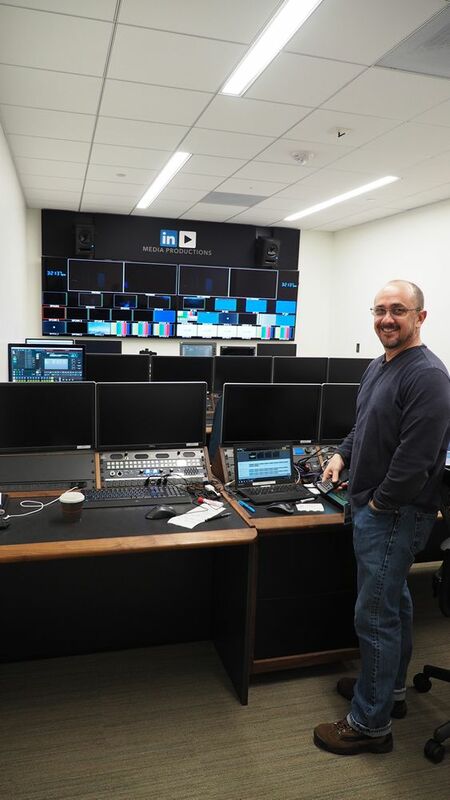 He sought, for example, to use real-time streaming between LinkedIn’s New York venue, which can host an audience for an event, and its control rooms on the West Coast, where a director and technical staff might reside, to produce content to support its sales and marketing services, internal corporate communications, and other ventures. Finally, there is the fact that technology is not simply a moving target but a fast-moving one. Continual evolution has to be part of the long-term road map, especially when early adoption is a fundamental part of the project landscape. To handle this issue, DCA was involved with the project nearly from the beginning and has been part of forward-looking meetings with vendors. “The key to making early adoption work is doing the due diligence: the communication and the relationships,” informs Schneider. “We have meetings with all of our core manufacturers about what technology is coming down the line, and David has come to all of those meetings, along with LinkedIn network engineers.” And it is not enough simply to look ahead. “Another hurdle is keeping everything afloat and working during these transitions,” Carroll cautions. Schneider and DCA are prevailing through all of these trials. The system was hard at work from the time it came online. “The New York facility went online last Friday, and on Wednesday we had two back-to-back shows that used the same control room,” recalls Schneider. “The first, ‘Transform Her,’ was a diversity event about women leaders in technology and other businesses, which was produced in Sunnyvale from the Empire State building All Hands venue. Then we did ‘Live with Marketers’ in the New York studio, which featured marketing professionals from New York and within LinkedIn, doing interviews in an Ellen/Oprah style with the couches and the nice chairs and the LinkedIn coffee mugs in the background. The old way to execute on those events would have required two complete teams, and involved traveling a bunch of people. That’s where the economy comes from with this system.” The system already has been used internationally, as well, with an event staged in Ireland being streamed to a Bay Area control room. The project is far from over for Schneider and DCA, and perhaps will simply be an ongoing effort, but barely a month into operation, in spite of the numerous and substantial difficulties of being at the “bleeding edge,” the benefits to LinkedIn already are clear. Get It In Writing are creative, proactive, and productive. Their work is innovative, informative and to the point. Daniel and the Get It In Writing team make you think seriously about your direction without being overly serious. They will encourage and empower you to do more than you thought possible. Great to work with, easy to get along with, and a great work ethic. Through their innovative approach and creativity, Get It In Writing has been a powerful resource in helping to shape our media strategies. Get It In Writing were always able to rise to the occasion and produce some excellent results for our company. The Get It In Writing team….turn complex technology into an easy read that the average Best Buy customer will understand effortlessly. Professional in their approach and always looking for industry trends in marketing communications as well as the pro audio market, Get It In Writing helps us engage our stakeholders in new and exciting ways. Get It In Writing® is a registered trademark.